UFC 228 was an amazing night for the Mixed Martial Arts company. 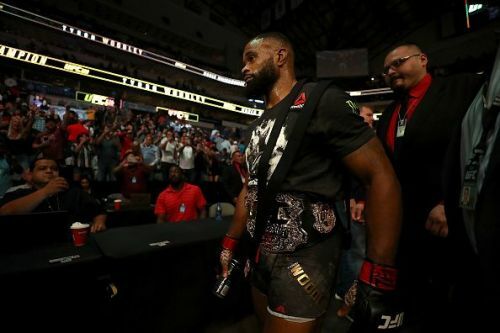 Although the expected winner of the main-event lost, Tyron Woodley reinforced his position as the Welterweight Champion in UFC; a position that had its share of doubters of late. Other than that, even the Prelims had their share of excellent fights, with one of the fighters even creating history. The fights were amazing, and more fights ended in Knockouts and Submissions than they did in decisions, which is also a sign of a good result from the card. No one had expected how good it would turn out, but the fact that it did shows the depth that UFC currently has. Some of the performances from the younger and newer members of the roster also revealed that there is a lot to come in the next few years. There were several moments from UFC 228, however, which ended up being overshadowed. Without any further ado, let's take a look at 4 things that you might have missed at UFC 228. While Dana White had built up Till and his loss must have been a big blow, at the end of the night Till had not really lost the respect of any of the audience or fans. Darren Till looked good going into the fight and survived the first round without any problem. However, his ability is something that should really not be in any doubt, despite the loss that he suffered in the second round. Early in the second round, Till got caught with a huge right punch to the jaw, that shook him immediately. He dropped to the ground, but in the split second that it took Woodley to realize what had happened, he had gotten his legs up. The guard he could get was anything but effective as Woodley rained down devastating elbows and punches directly on his head. Somehow, he tolerated this, and even tried to get Woodley close for a submission. He lasted on the ground for more than two minutes, tolerating the destructive ground and pound that Woodley attacked him with. Unfortunately for him, the main event of UFC 228 came to an end when he submitted, with Woodley locking in the D'Arce Choke. While the crowd lost their mind about the win by Woodley, what was lost in the mix was the fact that Till had put up a fight that could actually have seen him survive the second round if it had not been for the submission. The incredible tolerance displayed definitely deserves recognition.